Laurie Anderson contacted me in meeting her and showing her my work post that she invited me into “Real World Barcelona” a joint project between her, Peter Gabriel and Brian Eno. I submitted 8 proposals to her that were reviewed by Real World London and built a prototype that viewer participant went into meditative states of consciousness via the thalamus, video frequency and “real time sound”. “Flight” was a 35’ sq. cu. Ft. Multi-media installation that was composed of a 16 ft. wooden lath airplane (raised on a steel stand), two video monitors, and a 4.5’ acrylic stand/steel gun rack loaded with 100 + paper airplanes displaying the text “TO BE FREE”. The two video monitors played synchronized video images at various frequencies. The 16 ft. lath plane was constructed in four sections. The sections were made of 1/8” H x 1 ½” W wooden strips (pop riveted together) and hardware fabricated of sheet metal. The video frequency made the piece hypnotic for the audience (according to viewer feedback). 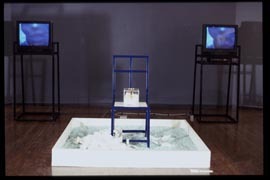 “Walking on broken glass/Choice” is a performance composed of three performers, tow video monitors, computer altered sound representing a heart beat, (a crucifix designed) steel chair, and a 6’ H x 6’ W x 6” D box containing 1,000 lbs. of broken safety glass. The video played at different frequencies laced with the audio track made the piece hypnotic for the audience (according to viewer feedback). 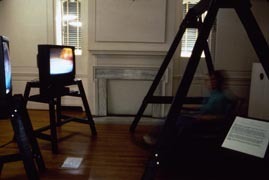 The installation was composed of the remnants of the performance, playing both the video imagery used during the performance and a video of the performance. 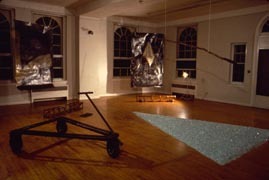 The installation remained for two weeks after the performance. 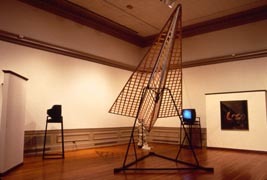 “Silence” was the first sound sculpture installation to be exhibited at The Delaware Center for Contemporary Art in the summer of 1990. “Silence” was a proposal for a temporary large-scale environmental sound sculpture.The installation simulated two proposed environmental sound spaces within coastal and stream landscapes. 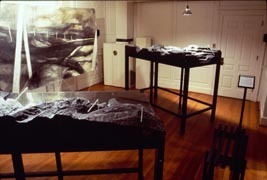 A 5’W x 12’L graphite drawing of a coastal landscape installation combined with the audio tapes helped create a clear visual image of the proposed sound sculptures with viewer-participants. A bench was also provided for the participants who spent longer time in the installation. The audio and ambience of the installation contributed to a hypnotic experience for the viewer (according to viewer feedback). "Fire & Waster' is an installation composed of three 5’Wx 7’H hanging paintings with cages entitles “Trust” (cast in Aluminum), “Faith” (recorded holographic ally) and “Durability” (etched in glass). Each of the words was a component of the cage structures. Each cage served the dual purpose of being both an exhibition element and a protective transport housing for the painting that it was displayed in front of. The “Faith” and “Durability” cages were solid units. The “Trust” cage disassembled into two parts, separating the cast word “Trust” from the structure. “Time” was a 6’Hx 10’Wx 10’D multi-media sound installation composed of two video monitors, a digital clock, a 7’ welded steel figure (lined internally with 280 strobe lights); and for sound a cello, a viola, a violin and Javanese bells (recorded with a sampler using a vocalizer). The video frequency and audio composite made the piece hypnotic for the audience (according to viewer feedback). 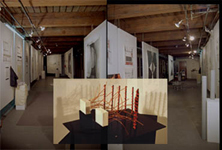 Several architects from Seville, Spain, I met at the Art Research Center in Kansas City funded me to develop a one-person multi-media exhibition, “A World Translucent To Our Likeness”. The Art Research Center was 4,000 sq. ft. I divided the center in half (20’W x 100’L), exhibiting the “Fluorescent Pinwheel Construction” in one section and seven proposals for sculpture works in the other. 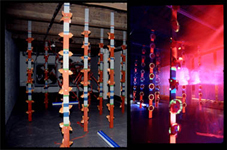 The light frequency (strobe + pinwheel fluorescents) and audio composite made the piece hypnotic for the audience (according to viewer feedback). “Sound Trees”, pictured on the right, was a 15’ ft. sq. 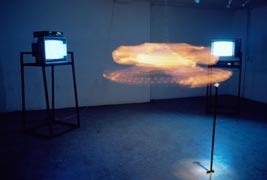 viewer-participant sculpture. It was composed of 30 1 cu. ft Egyptian styled trees, 50 galaxy plates and a 5.5’H x 2’W x 1’D center structure. The plates, which were attached to the trees, had images of galaxies painted and etched on them. The 5’5”H center structure amplified layered sounds of a car engine, computer, telephone radio and various animals. As viewers passed through the space over the course of a day, they rearranged the tree pieces and attached plates. This way, the sculpture changed multiple times.